"Tracing connections between Duchamp, Debussy, the Wu Tang Clan… [DJ Spooky] shows how art and idealism can activate each other…"
Hip-hop savant DJ Spooky joins members of the acclaimed International Contemporary Ensemble (ICE) to create a riveting electronic symphony in Terra Nova: Sinfonia Antarctica. 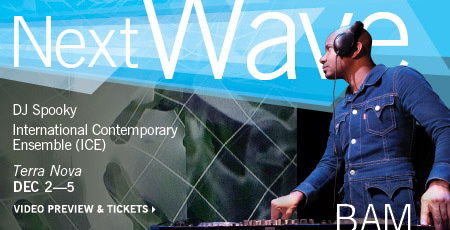 Featuring DJ Spooky's sound recordings of ice in the Antarctic and video projections, this bold new work allows us to encounter climate change with unprecedented intimacy. BAM 2009 Next Wave Festival is part of New Works and Diverse Voices at BAM sponsored by Time Warner Inc.